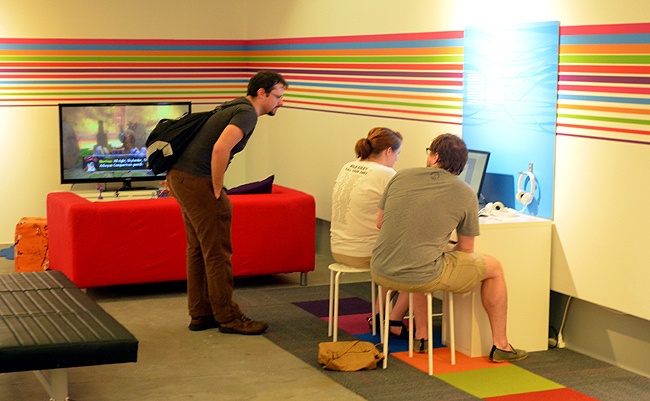 Earlier today I popped into the Museum of Design Atlanta's (MODA) newest exhibition, "XYZ: Alternative Voices in Game Design" just to make a few photos. Well, two hours later and after earning a couple of spaces on the 'high score' board of Centipede, I finally had to pull myself away so I wouldn't be late for my next destination, but departed with the resolve to return very soon—I'm totally going to make highest score on Centipede! XYZ opened only a week ago, so you still have plenty of time to see the exhibition...and play some of the more than a dozen video games and other clever games. I'd encourage you to go with a friend or friends...while there are a number of solo games, a lot of them are two or more players, so to make the most of it...bring friends! XYZ runs through September 2. 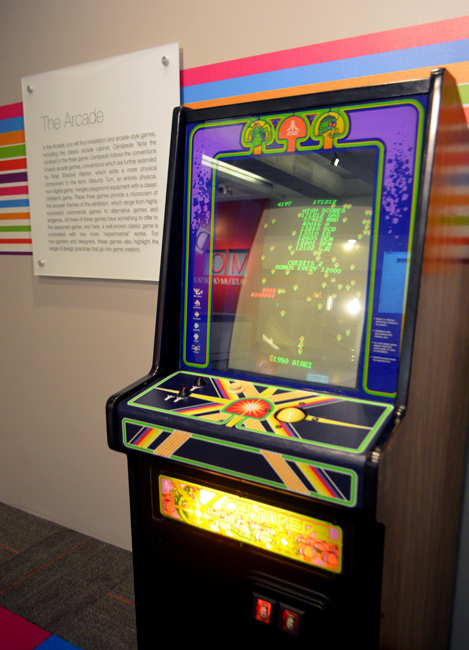 The games run the gamut in kinds and types...they have everything from the classic arcade favorite "Centipede" to video games of strategy with Hollywood-quality graphics, teaching video games to games of reflection. It was super cool to see the Museum so busy on a Sunday afternoon, and even cooler than that was the visitors represented so many very different people...there were people of various ages—from young kids to senior citizens—and men, women, friends, families, and even people on dates...what a great place for a fun, not-the-expected kind of date! 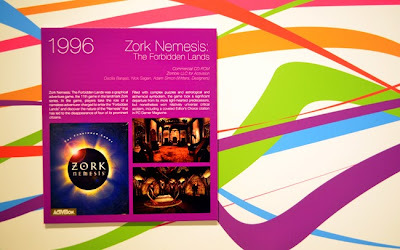 The exhibition is very much like a lot of previous MODA exhibitions with regard to its having something for everyone. Yea, yea, I know..that sounds corny, but it's true. 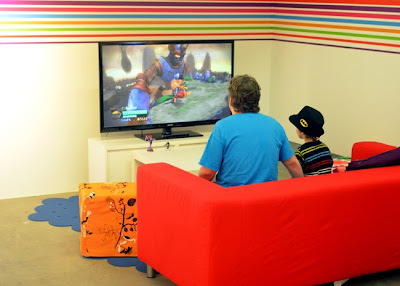 The gamer, video game enthusiast, history buff, design student, vacationing family, and tourists of all kinds are going to have a great time here. 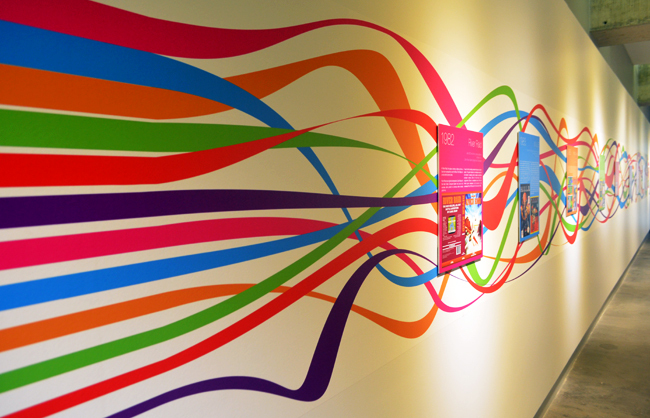 I love how MODA utilizes its hallway gallery! For this exhibition, it's their "Timewall", which features milestones in game design and games created by women. 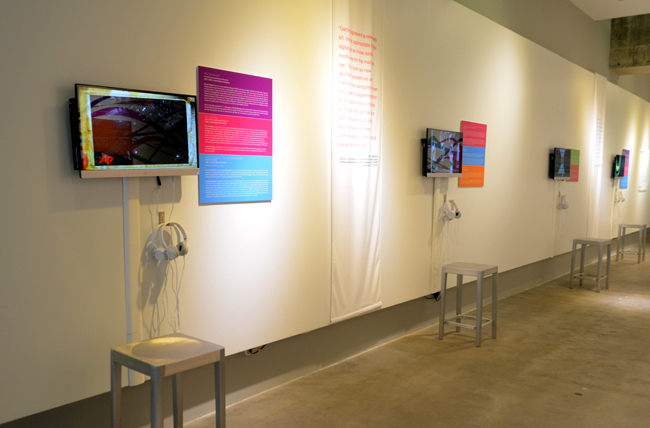 "XYZ: Alternative Voices in Game Design" is the first-ever exhibition that highlights the work of women as game designers and artists by presenting a broad spectrum of playful interactive media of all types." The Timewall chronologically presents some of the more significant contributions by women in the game design arena...some you'll know and some you'll learn about for the first time. 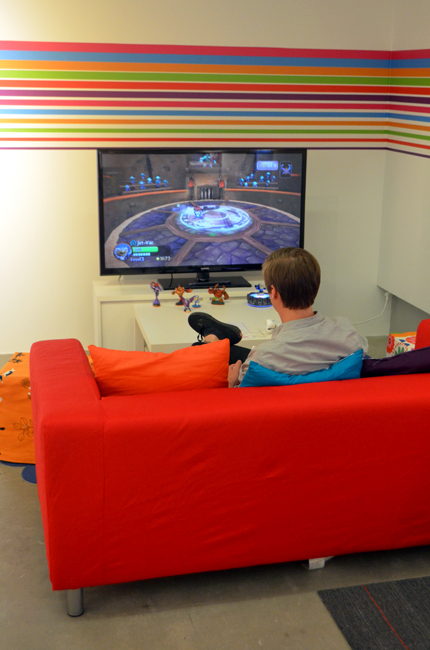 One of the more familiar stops on the Timewall is "The Sims", one of the most commercially successful video games of all time. Do you remember The Sims? 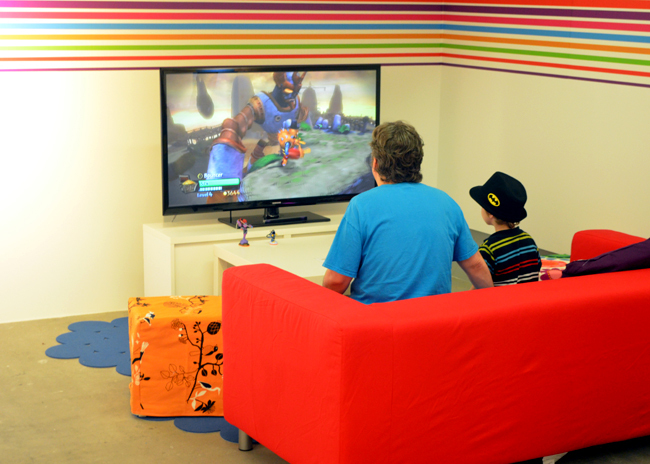 "The Den" is a great space, in another of the galleries, where home-inspired settings are staged for group play. And there are friendly volunteers helping visitors with the various games and answering exhibition questions. Photography is permitted except in the back gallery, where there are some super cool aspects of the exhibition. "Much like photography, paintings, literature and music are capable of transmitting the full range of the human experience from one human to another, so too can games." Also, Brathwaite recently authored "Breaking into the Game Industry," which is available in the Museum's gift shop, as are a range of books about gaming. The next time I visit, I'm going to make sure I don't have to be anywhere! Speaking of visiting, there's some fantastic programming scheduled for XYZ. There are Field Trips, Design Conversations and Drink in Design events that span the duration of the exhibition. I already have several on my calendar. A number of the events are on the exhibition's brochure, but others have been added since printing, so you'll want to "Like" them on Facebook to be sure you learn about all that's going on...that's how I found out about the Field Trip to MOCA-GA this coming Friday! Oh, I almost forgot to tell you about "Flatlands", a game in the back gallery by Nathalie Pozzi and Eric Zimmerman with graphic design by Rachel Morris. It's a three person game—two players and a judge. What totally blows my mind about this game is that it utilizes 165 game boards! Doesn't that sound like loads of fun?! The exhibition is a progressive one, too. 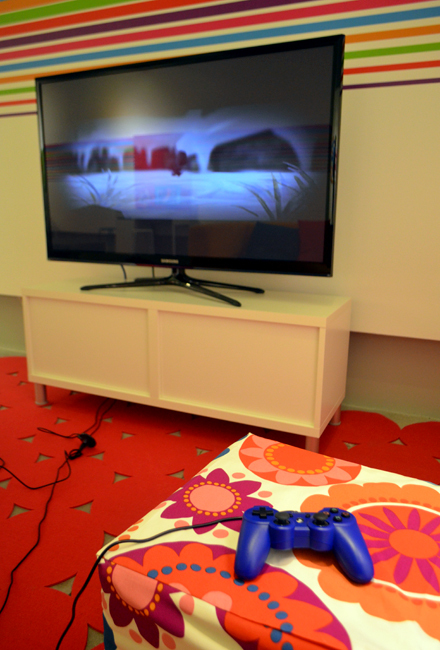 A couple of the featured games, "Mainichi" and "Dys4ia", are autobiographical games that explore the experiences of someone going through gender reassignment, with the specific goal of creating an atmosphere of empathy and understanding. 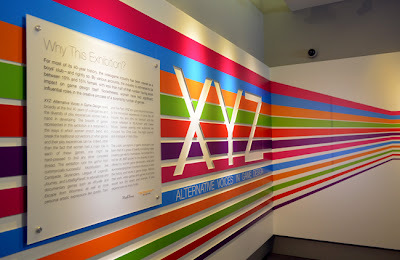 Whether a zinser or a vacationing family, come to XYZ: Alternative Voices in Game Design for a little learning, a little history, some culture, and lots of fun. And remember to connect with MODA on Social Media. And if time is a challenge, the Museum is open until 8:00 p.m. on Thursday evenings. 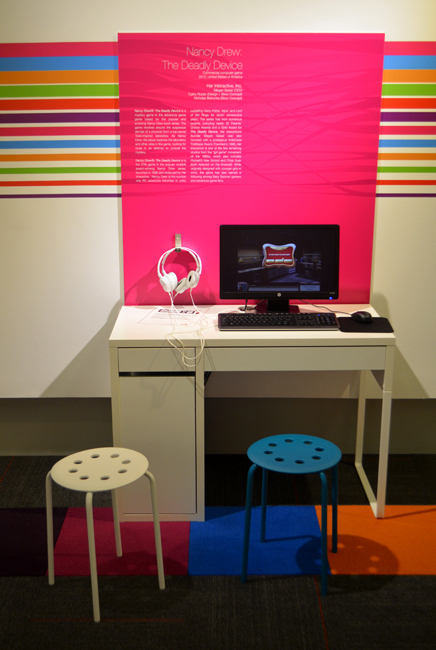 For the first-ever "exhibition that highlights the work of women as game designers" I think the Museum of Design Atlanta (MODA) has done a superlative job! They're definitely on the 'high score' board with this tourist!